WASHINGTON (June 09, 2008) -- Secretary of the Army Pete Geren stepped away from his desk at the Pentagon for a few moments, June 9, to spend time with some of the youngest members of the Army Family. The secretary visited the Child Development Center at Fort Myer, Va., just minutes from the Pentagon, to read to the children there a new book by Army Youth Services titled "Happy Birthday Army." Secretary of the Army Pete Geren and an Army youth at the Fort Myer, Va. Child Development Center, exchange glances following an exchange of birthday cards, June 9. Children at the center created the cards in honor of the Army's 233rd birthday and presented them to the Secretary. 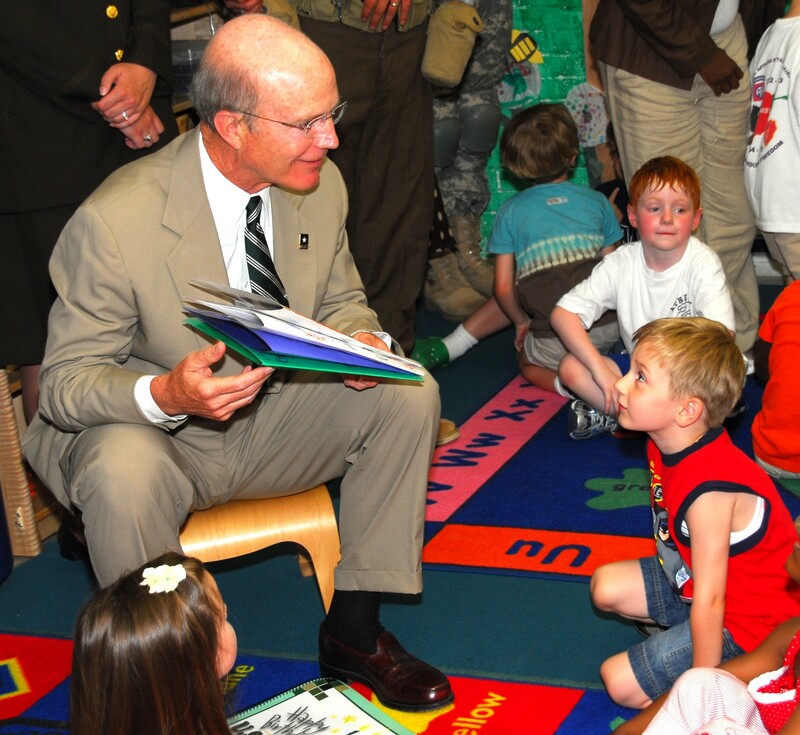 After, the Secretary read to the children a new book, by Army Youth Services, called "Happy Birthday Army." The book was part of an effort to better include Army youth in the service's 233rd birthday celebrations. "I'm so glad I could be here today, and share this occasion with you," Geren told a room full of tiny, squirming Americans. "The Army is how many years old this week? It's 233 years old. And a whole lot has happened in those 233 years. And you are all a part of that -- that great history." This year, the Secretary has directed that youth be included in more of the Army's birthday celebrations. One reason for that, he said, is that the children of American Soldiers are an integral part of the Army Family, and thus, part of Army history. "Every year we stop and celebrate the history of the Army -- this year it is the 233rd birthday, and the children are an important part of that history," he said. "They are part of the Army family, and they are part of the great citizens who are standing up and being part of the Army Family during this difficult time for us. We want them to know how much we appreciate them." "We want our children in the Army to appreciate the history of the Army and appreciate how much they are a part of the history of the Army," Geren said. "When we look at the contributions our Soldiers and their families make, our children are a very important part of that, and we want them to celebrate with us." Book co-authors Donna M. McGrath and Mary Ellen Pratt, both with Army Youth Services, say the intent of the book is to impart on youth the breadth of Army history, the importance of the contributions of their military parents, and their own place in the Army Family. "We wanted to highlight for young children the importance of what their parents are doing in the Army, the richness of Army history, and their part in this huge wonderful organization," McGrath said. Following the reading of the book, children sang "happy birthday," sang the Army Song and enjoyed cake with Secretary Geren. Each child was also given a copy of the book to take home. Army CYS has prepared some 60,000 copies of the book for distribution to youth on garrisons worldwide. Each garrison is expected to hold functions similar to the one at Fort Myer -- with local community leaders or mentorship figures reading the book to children -- during the week leading up to the Army's June 14 birthday.